You play with two dice and journey through a theory of everything to find your place in all of life and to discover how to live your life to the fullest. This is the story of how everything I have done in my life has coalesced into the creation of a platform for the emergence of the “ChancesToChange board game”. This game was birthed in December 2016. Guest House Facilitation practice manifesting as a U wave. A three-dimensional view of the Life Pulse. Adding deep human aspects to the infinity symbol. Flipping the orientation of the infinity symbol. 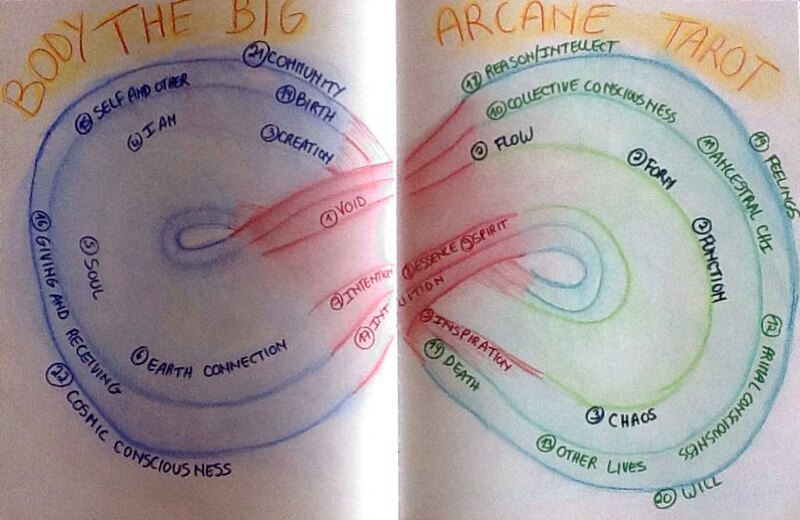 Theory U shape-shifts into an infinity symbol. A specific colour code in alignment with the emerging knowledge. 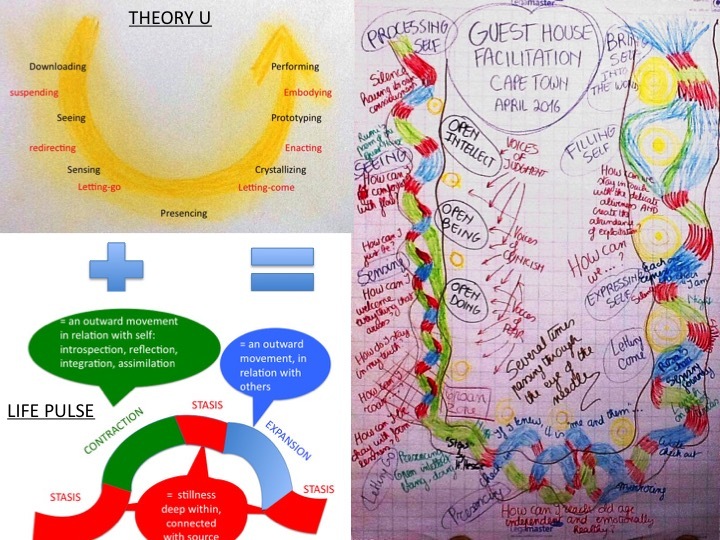 Guest House Facilitation is a complex, interconnected and continuously changing practice, it is fluid and smart-flexible. It is a process of experiencing which can only be expressed in words afterwards. The Guest House Facilitation mission is to listen to all voices, even to the whispers. 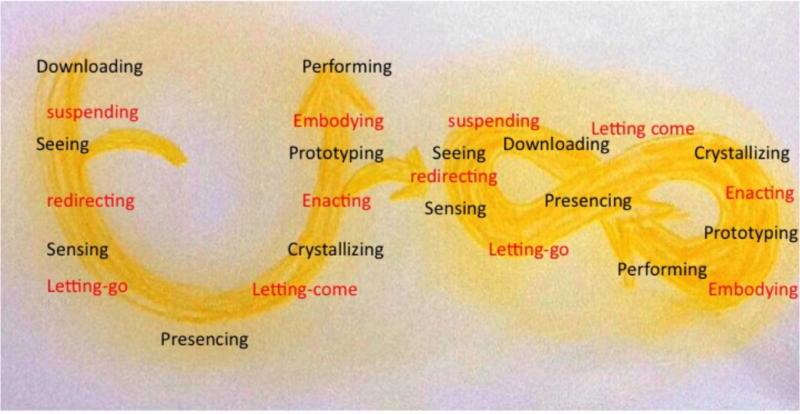 Theory U (top of the picture above) has been developed by Otto Scharmer and his team, it is a change management method where leaders move through a process of inner knowing and social innovation. Theory U is a framework indeed a method and also a way of being. The Life Pulse (bottom left in the picture above) is a cosmic principle with different phases: stasis (red), contraction (green), stasis (red), expansion (blue). Stasis or pause is stillness and emptiness. It is an inward movement connecting with our inner being. Contraction is an outward movement where we enter into relationship with our personality. Expansion is an outward movement, where we enter into relationship with the collective field. The first representations of the Life Pulse and the Theory U during our Guest House Facilitation gatherings were U forms with waves (picture above on the right). The U process is what happens as Guest House Facilitation (GHF) unfolds. The U process transforms and shape-shifts GHF and vice versa. We create space for this fascinating and wonderful process through graciously bringing our attention to the cosmic principle of the Life Pulse. Panarchy is the study of the interactions between economic growth and human development and how they depend on ecosystems and institutions. 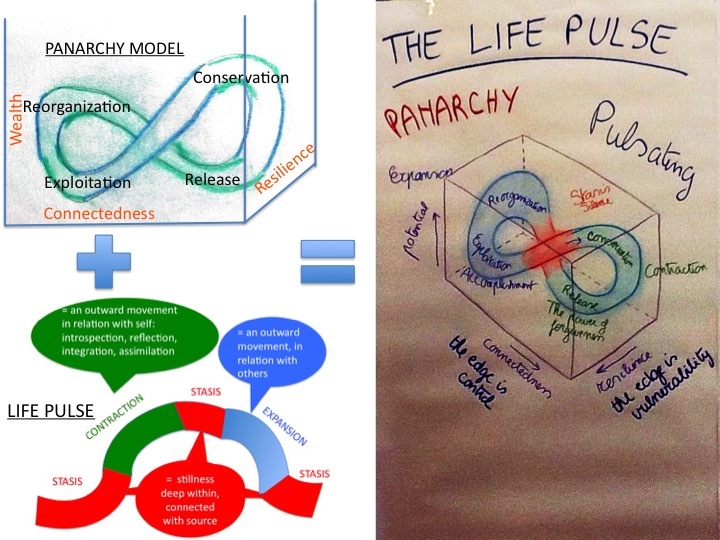 In a step-by-step process by adding the ingredient of Panarchy to the Life Pulse, the Life Pulse naturally emerged as an infinity symbol (April 2016). Contraction (green) and expansion (blue) become loops and both meet in the middle where the phases of stasis (red) are superimposed. The emergence of the Life Pulse as an infinity symbol happened very quickly and from that moment on, the infinity symbol became an integral part of the Guest House Facilitation practice. We explore connectedness and individuality, resilience and vulnerability in relationship with the Life Pulse. In August 2015, my deep love and appreciation for the physical body gave rise to the idea of creating a Body Tarot card deck to inspire others on their journey with their body. During the following months, a Body Tarot group was formed. We are crafting a Body Tarot card deck of 120 cards (22 big arcana cards, 70 minor arcana cards and 28 court cards). The Body Tarot is a vehicle to allow a fuller expression of our true self through listening to our body. The 22 cards (0-21) of the big arcana each represent an aspect of being human starting with the “Void” and comprising fascinating aspects like “Collective consciousness”, “Relationship”, “Community”, ending with “Cosmic Consciousness”. Those 22 cards organise themselves as three waves of the infinity symbol shown in the picture below. These big arcana cards affect the Guest House Facilitation practice and are affected by GHF in return – cross-fertilization unfolds. Through the lived experience of the lemniscate within the practice of Guest House Facilitation the orientation naturally changed. The outward movement of contraction (green) flips to the left side and the outward movement of expansion (blue) flips to the right side. The inward movement of stasis (red) stays at the centre of the infinity symbol. 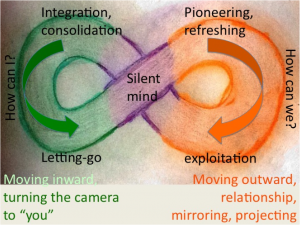 In the course of Guest House Facilitation new elements are added onto the infinity symbol such as the difference between inner and outer potential, vulnerability as the other side of resilience and individuality balancing connection. All those seemingly opposite aspects are a continuum and need each other in order to keep the fluidity in the whole system. The U transforms into an infinity symbol as described on the picture below. The down part of the U makes a loop as does the upwards part and both meet in the middle in the area of presencing. This is a huge revelation within the practice of GHF: each time we have finished a U, we come back to the centre and prepare for another ride. The centre is the presencing, the connection with source, with our essence. Slowly a specific colour code emerged. The primary colours are blue, red and yellow. Blue is the colour given to the soul and spiritual family. Red is the colour used for the physical body and the earth. Yellow is the colour assigned to the collective field and our biological family. You can recognize all these colours on the left side of the picture below. Mixing up these colours give the other colours as can be seen on the picture above on the right. Red and yellow give orange. Orange becomes the colour for expansion, for the outward movement into relationship with others. Our body (red) interacts with the collective field (yellow). Blue and yellow give green. Green becomes the colour for contraction, for the outward movement into relationship with our personality. Our soul (blue) interacts with the collective consciousness (yellow). Red and blue give purple. Purple represents the stasis, the silent mind through the intimate connection between our body (red) and soul (blue). Magenta is red, blue and yellow or green, purple and orange. Magenta is the colour associated with mind. This colour code is applied throughout all the graphic facilitation of the practice of Guest House Facilitation. In December 2016, I was guided to intuitively craft a board game to play with my family on Christmas Day. My husband, our four children and their partners are my tribe and my most precious container on my journey to create the more beautiful world my heart knows is possible. I experienced a deep desire to celebrate their magnificence and find an easy way to transmit what makes me so full of joy and aliveness. The result was the first prototype of this board game. You might notice that the board has blue dots. 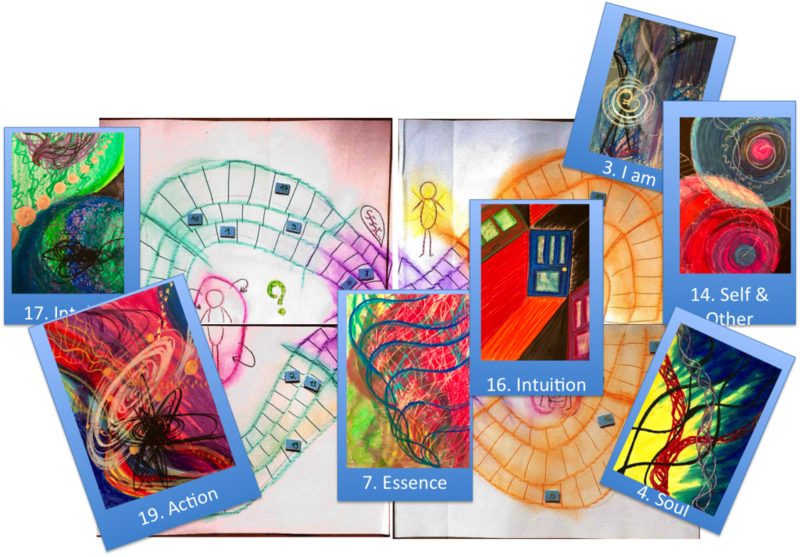 These are the big arcana cards of the Body Tarot and as already explained these are all aspects of being human. The infinity symbol simplifies into its current form in the board game, while still retaining all its content (from Theory U and Panarchy). The green and orange areas each have three different phases. This is an integration of Theory U, the Life Pulse and Panarchy with a lived experience of the practice of Guest House Facilitation and seasoned with the big arcana cards of the Body Tarot. These cards are deep human aspects which we are normally not aware of. The outcome is an amazingly simple board with all these levels of knowledge underneath and supported by the being of this game. This being is a living organism following universal laws. This process of shape shifting and emerging reveals both the holographic and holistic aspects of the board game. 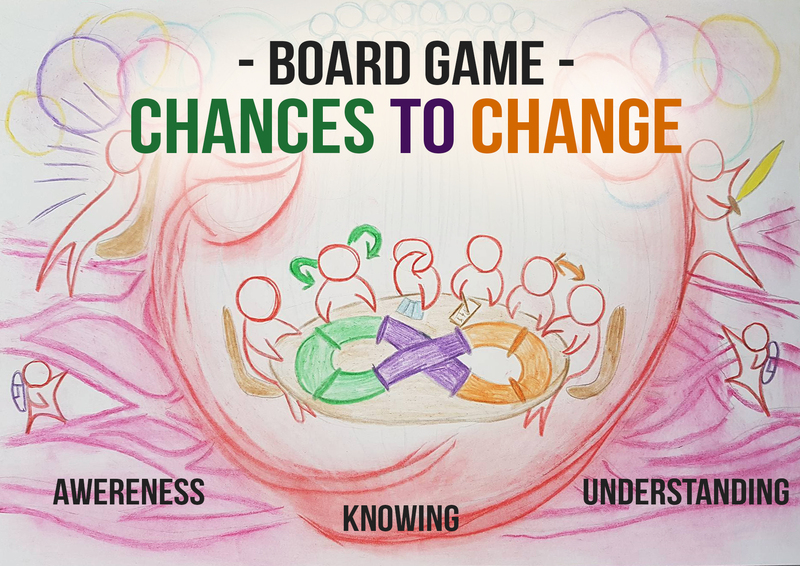 The board game received the name: ChancesToChange. Did you enjoy this post? If so, please share on your favourite social media (buttons below). It’s a HUGE help for me and I am always really grateful. I am a social entrepreneur, a change-maker, a physician, a healer, a facilitator, a trainer, a coach and an author. I shift and take on different roles. 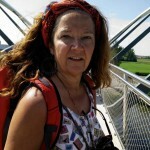 I spent nearly three decades of my life as a physician specializing in geriatric care, including a 21-year career as department head in an Antwerp regional hospital, until August 2012. In 2003, I began my studies as an energy healer, teacher, process facilitator and supervisor at the Barbara Brennan School of Healing. Till 2014, I taught at the Barbara Brennan School of Healing Europe. In 2010, Jim Rough trained me in the practice of Dynamic Facilitation, which I moulded through workshops and training sessions into a new integrative practice of facilitation which I call ‘Guest House Facilitation’. In 2013, I wrote and self-published a book, Becoming What is Changing: Exposition, it is the first part of a trilogy. The book integrates a great deal of my experiences in the hospital with the elderly and our caregivers’ team. The aim is for each of us to allow the emergence of the kind of transformation into our lives and workplaces, so that we can create an environment where we and others are joyful, alive and continuously growing. In 2012, I discovered the Art of Hosting community. I attended several workshops and had the opportunity to be on the hosting team of several gatherings in Zimbabwe, South Africa and France. One of the cornerstones of my practice is Theory U designed by Otto Scharmer. I have followed the u.labs over the past two years. In August 2015, my deep love and appreciation for the physical body gave rise to the idea to create a Body Tarot card deck to inspire others on their journey with their body. During the following months our Body Tarot group was formed. Everything I have done in my life has coalesced into the creation of a platform for the emerging of the “ChancesToChange board game”, birthed in December 2016.